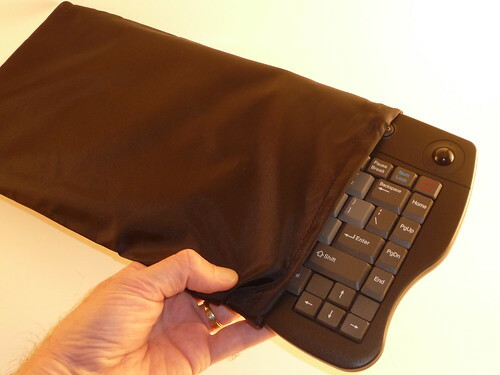 Anti-dust keyboard pouch - this is a nice touch on the part of Vidabox to include this as it just gives you that feeling that you're dealing with a "premium-quality" product. Installation as you might expect from a keyboard is very easy. Install the three AA batteries into the keyboard. Plug the receiver into to a USB (1.1 or 2.0) port of your computer. Finally press the sync button on the keyboard and the computer should then recognize the keyboard input. I didn’t even have to synch the review keyboard – I just plugged the USB dongle into the computer and after the drivers self-installed on my Windows system it just worked. If you do this and it doesn’t respond you can press the sync button on both the USB dongle and the keyboard to get the two to sync up. When I used it with my SageTV HD Theater extender/player I did need to restart the extender for it to recognize they keyboard. 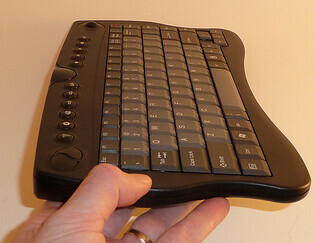 The Vidabox is only 13" long, very thin and pretty compact – about the size of a laptop keyboard. 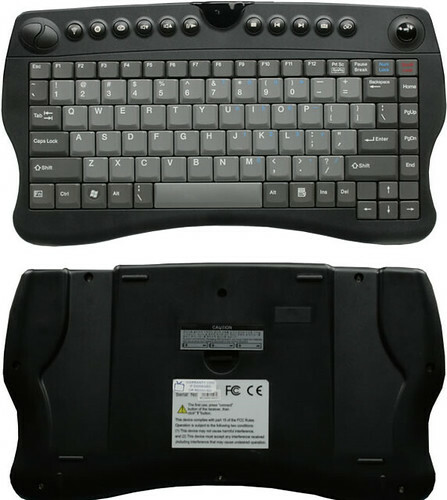 The keyboard is black, sold plastic with mouse buttons on the top-left, media keys across the top and the mouse-trackball on the top-right. The standard qwerty keys are colored gray while the other keys are all a darker shade of grey. All text on the keys are white except for the NUM-Lock and Num-Pad keys which are both blue and the Scroll-lock key text which is red. To save space, many of the function keys are slightly smaller than on a standard keyboard but the arrow keys are nicely separated and all keys were placed nicely. 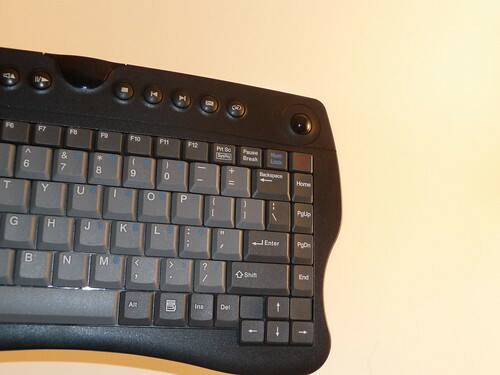 The 10 media keys are placed across the top of the keyboard with the RF receiver in the center. 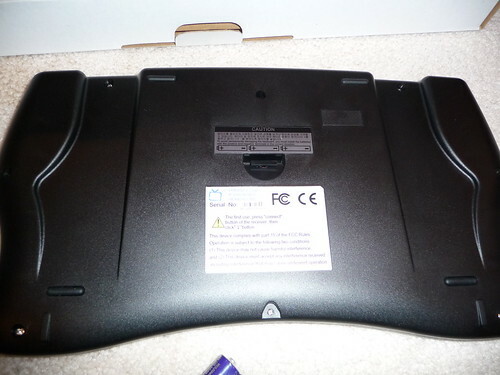 The underside of the keyboard reveals the battery compartment, four rubber "feet" and a nice inset cutout for easy grip when holding the keyboard in your hands. Details like this are appreciated and really show after a little time with this keyboard. The battery compartment is pretty small, but holds three AA batteries (included) and has a red ribbon to make it easier to remove the batteries. The RF range is very, very good. I was able to use the keyboard up to 28 feet away from the HTPC. I tried it from a nearby room through walls and it worked without errors - something quite amazing even for an RF wireless keyboard. The trackball, located at the top-right of the keyboard provides excellent mouse motion. The 2000 dpi laser trackball pointing device with mouse buttons is very accurate and easy to use. It’s also located in the perfect spot on the keyboard to control with your thumb without having to set the keyboard in your lap. The trackball feels solid and works without effort to move the mouse pointer around the screen. Something that can't be said for all HTPC keyboards. Media Center Keyboards - What's Important? Must be wireless RF or Bluetooth - range is very important for larger rooms. Size - smaller is better, but still need to be able to operate the keys. Not too heavy of course. Ease of Installation - "synching" of keyboard with computer etc. There are many other factors, but those are the most important ones to watch for. Battery life is excellent. I've been using since November and haven't needed to replace the batteries yet. The built in laser trackball is ideal for mouse control. 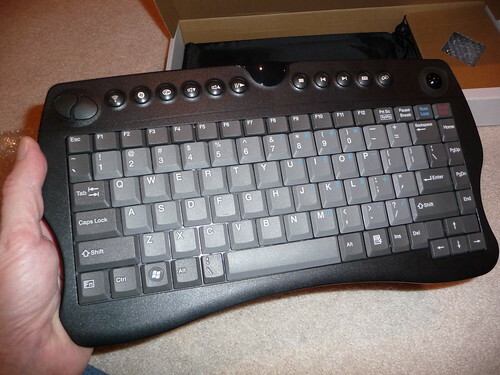 I like it even better than the joystick control on my BTC 9109urf keyboard. Trackball is on right side, right and left-mouse-click buttons are on the left side. This works for me, but might be a problem with some left-handed people. Two hands required to operate the mouse and keyboard. This is a common element of media center keyboards. I used the slightly older version of this keyboard for over a month earlier this year and this updated keyboard for about a week. The excellent wireless range, nice look feel and layout and well designed trackball mouse functionality makes the Vidabox Premium Wireless Keyboard a success. 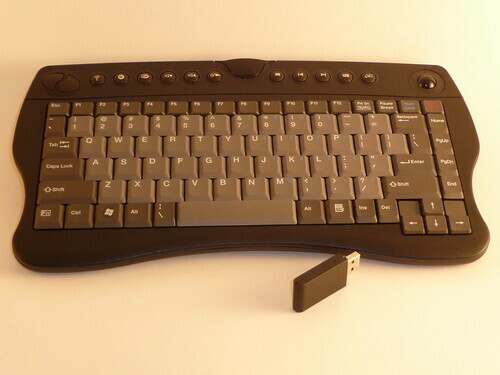 This is by far my favorite wireless media keyboard – highly recommended! Stay tuned for info on how you can win this keyboard at GeekTonic.